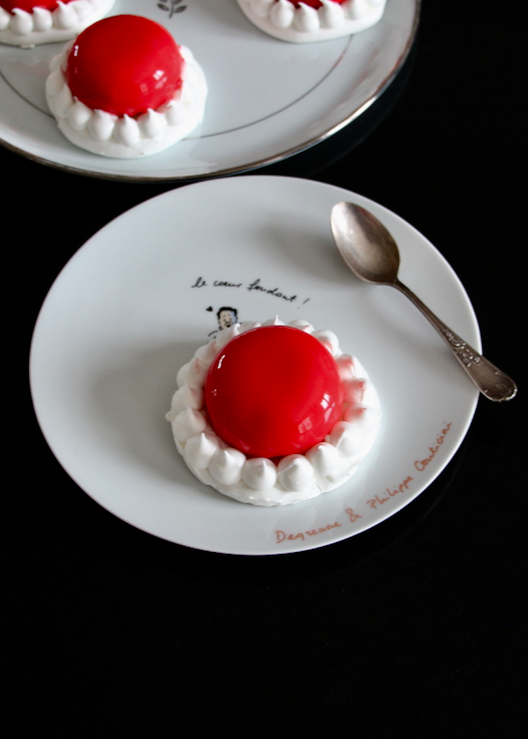 I want red today… To celebrate Valentine’s Day, or Christmas, or just to enjoy a good dessert with style!! Here is my raspberry and meringue entremet! Kind of nice don’t you think? 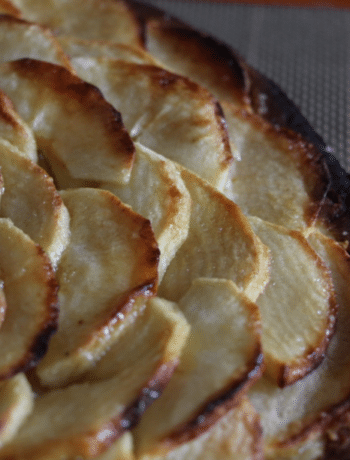 So you may think it’s lovely but you won’t be able to make, too complicated and stuff? And guess what?? It’s not and that’s a pretty awesome news!! 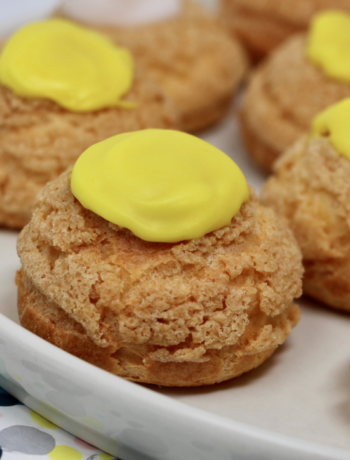 This dessert is made with simple preparations if you have a good hand mixer or a good food processor. 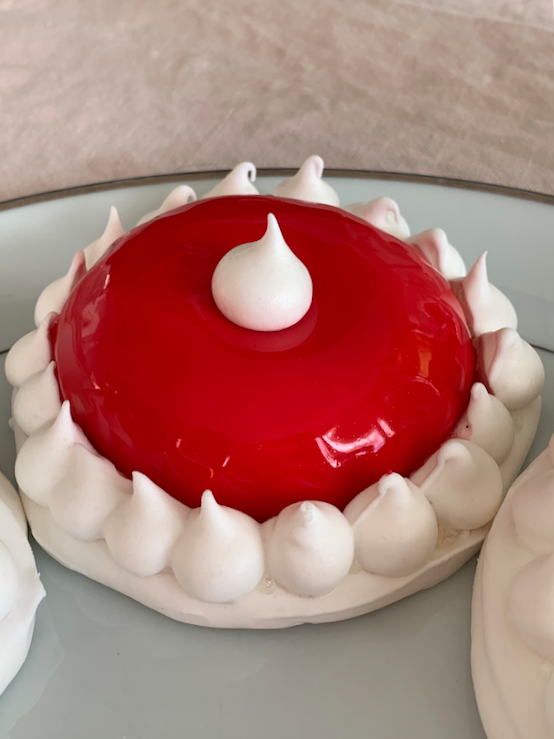 Besides, you will have to make some of the elements in advance which will make it easier for your on D day… Please note that you will have to make the mousse and the inserts at least the day before eating this entremet. I already introduced my chocolate, praline and raspberry tarts with chocolate icing. 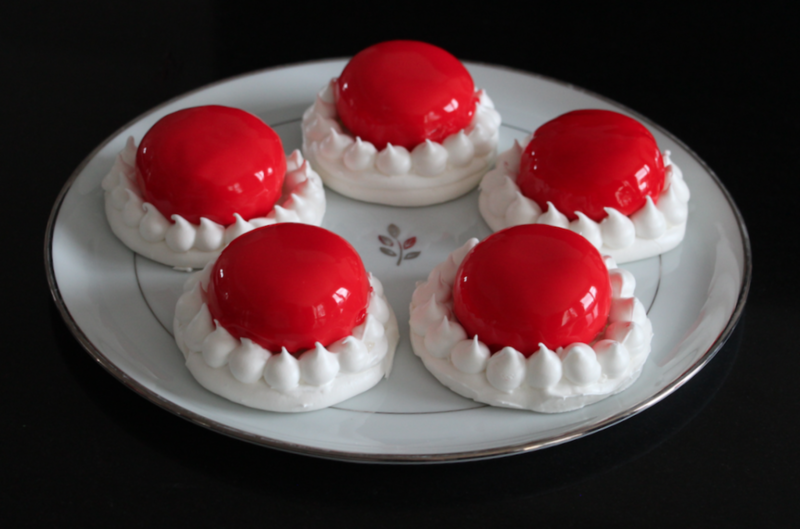 Here the icing recipe is very similar: you will only need water, sugar, cream and coloring powder. You see, no weird ingredient that you can not find in your usual supermarket. 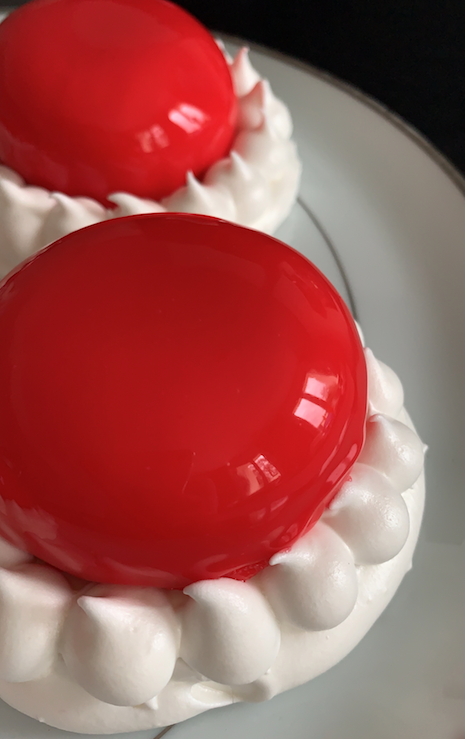 As far as decoration is concerned, you just do whatever you want with this raspberry and meringue entremet: either add nothing, or a little meringue, a fresh raspberry, etc. 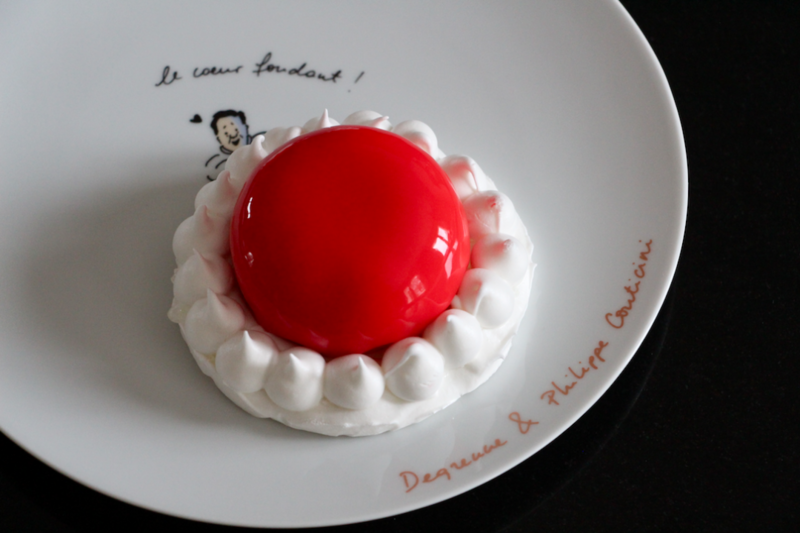 (Presentation: dessert plate collection Degrenne x Philippe Conticini). 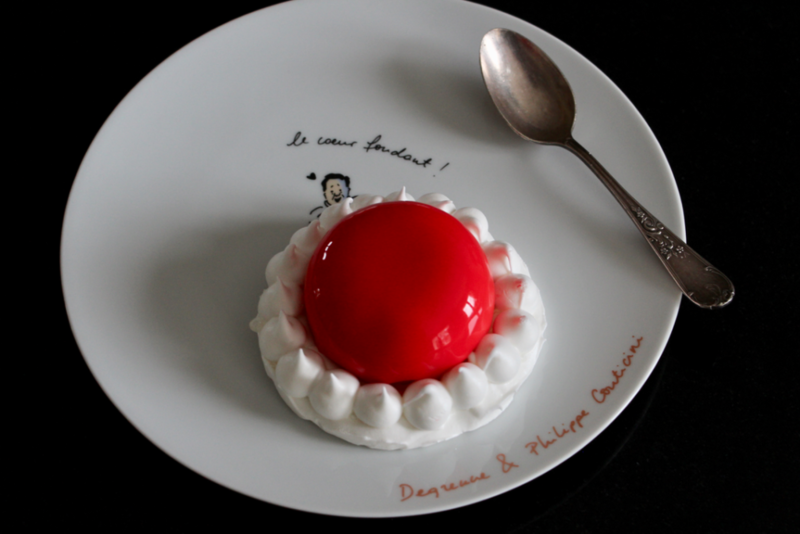 And you can of course make this recipe as an entremet to share. The recipe works perfectly too! And a food processor to whip the chantilly cream for the raspberry mousse. Get the juice from the lime. If you have a Thermomix, put all the ingredients in the bowl for 6 minutes, speed 5 at 80 degrees. Then go to step 8. If you don't have a Thermomix, put all the ingredients in a pan. Cook gently for 12 minutes with a cover on your pan. Sift the sauce to take away the seeds. Pour in your insert molds. Freeze for at least 3 hours. Sift the jam to take away the seeds. 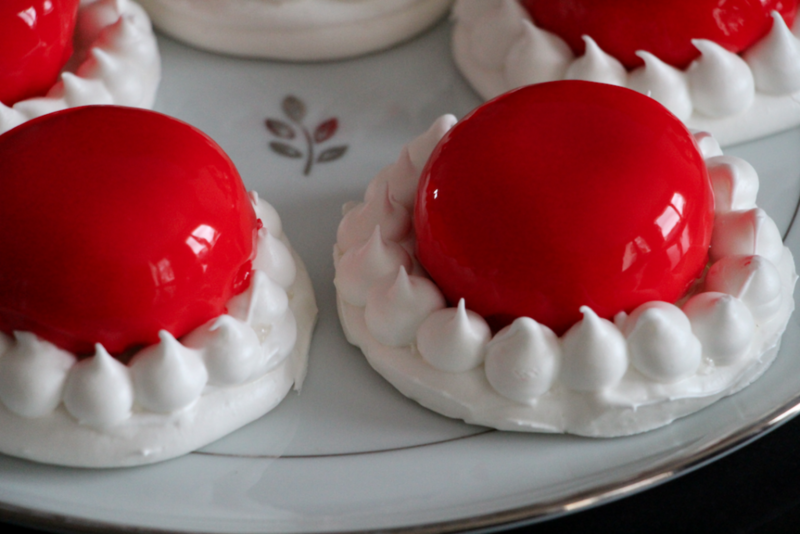 Make a firm chantilly cream with the cream and add gently it with a spatula to the previous mixture. Pour the mixture in your molds up to half. 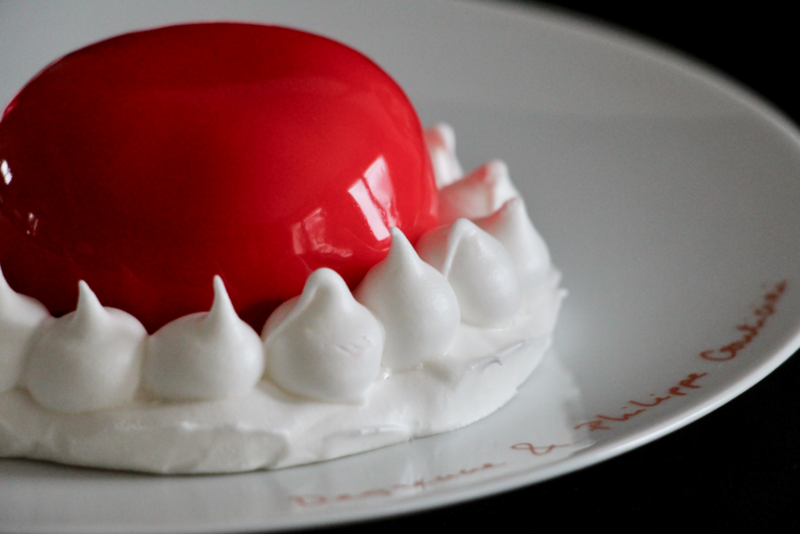 Place a frozen piece of raspberry sauce and cover with more mousse. Set aside in your freezer for at least 6 hours (a whole night is better). Pre-heat your oven at 90 degrees. Pour your egg whites (at room temperature) in your foodprocessor bowl. Start at speed 4 (on a scale from 1 to 6) and whisk. When the whites start to be foamy, add little by little the caster sugar (in 3 times). Keep on whisking for 5 minutes until you get a compact mixture. Add the icing sugar and mix gently with a spatula. Stop when you get an homogeneous mixture. 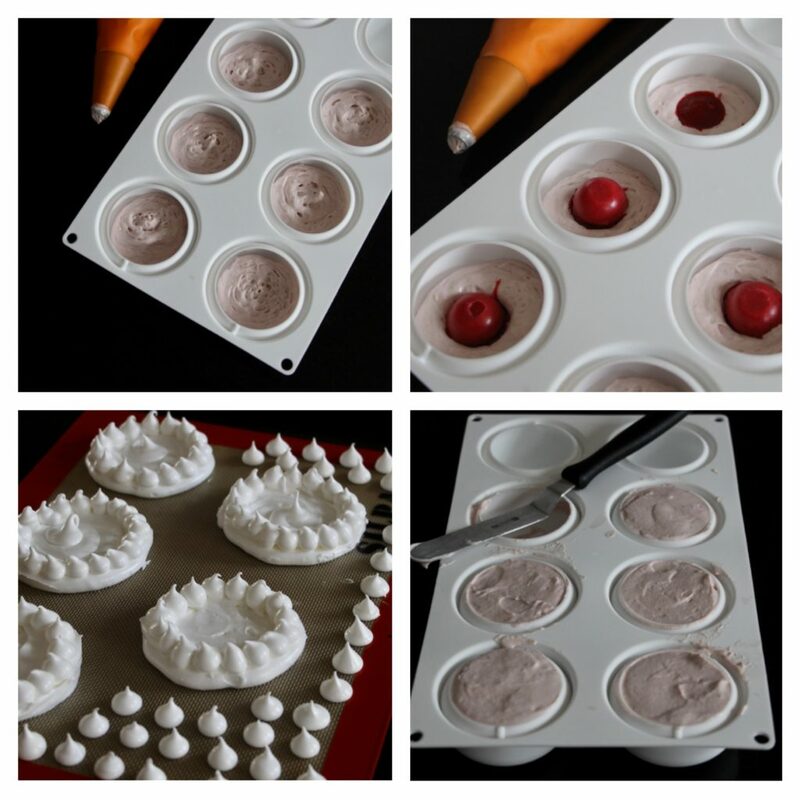 Use a piping bag and nozzle to make your meringues and place them on a silicon baking mat or a sheet of baking paper. Bake for 1 hour 20 minutes. Place the sheets of gelatine in a bowl with cold water. 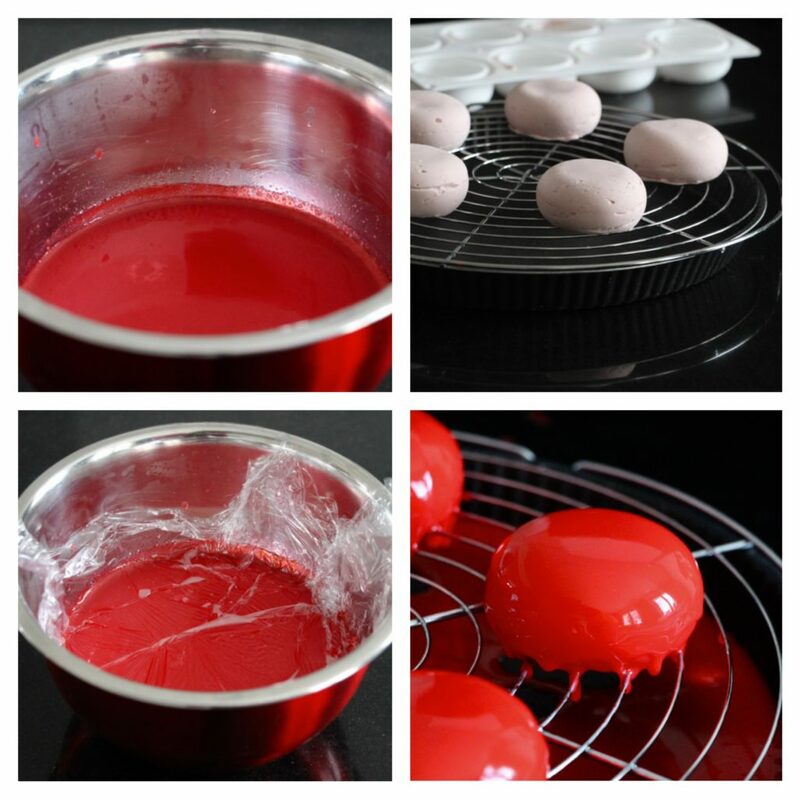 Pour the water, sugar, red coloring powder and cream in a sauce pan. Heat until it boils whilst whisking. Remove from the heat, sift and add the gelatine sheets. Mix. Place a cling film on the surface of the icing and let cool down (you will use this icing with a temperature of 30 degrees). You can hit gently the bowl against your working plan to help the little bubbles get out of the icing. Make the final mounting (this is it!!). Get your mousses out of the freezer and place them on a grid. Below the grid, put a plate. Pour at once the icing (with temperature at 30 degrees) on the frozen mousses. 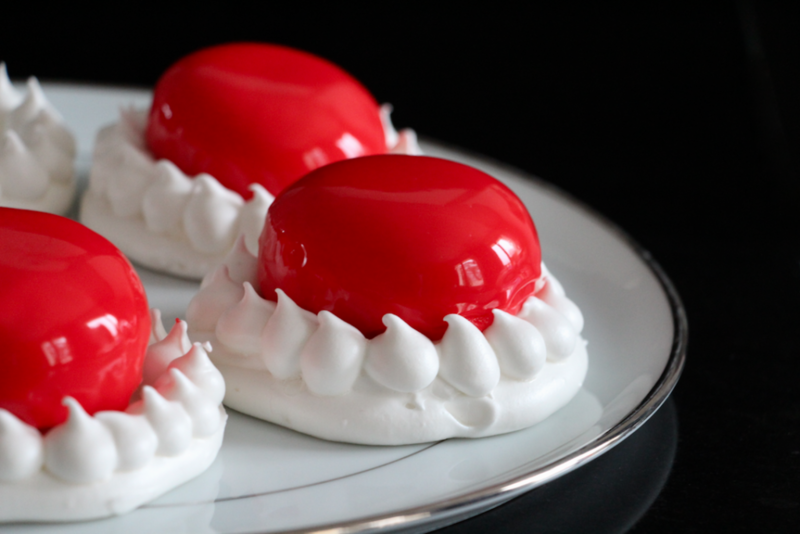 Leave to rest 2-3 minutes and place each mousse on a meringue. 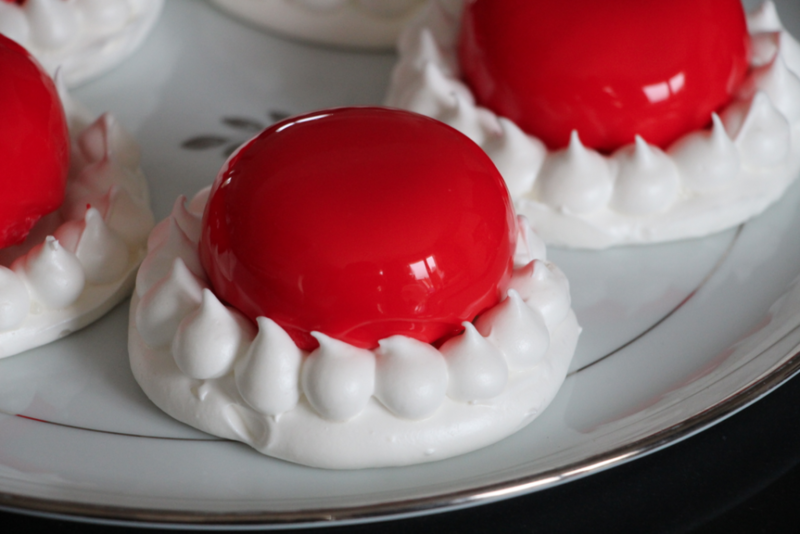 Decorate as you like and set aside in your fridge until serving (3 hours at least so that the mousse can defrost). 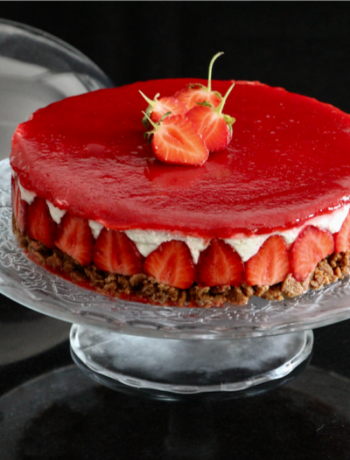 Hey Buddy!, I found this information for you: "My Raspberry and Meringue Entremet". 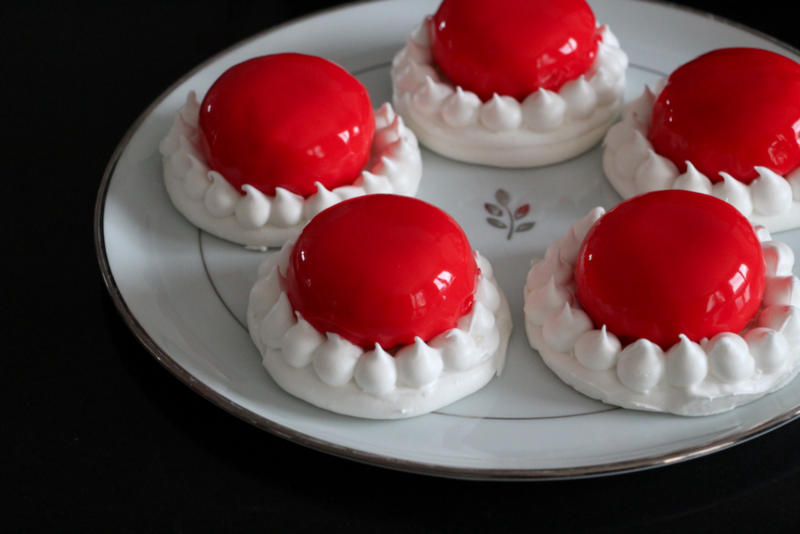 Here is the website link: http://www.casseroleetchocolat.fr/en/entremet-framboise-meringue/. Thank you.